Alcatel isn't taking things, ahem, Easy after showing off its latest Scribe phablet at MWC 2013. The company has followed up by unveiling the new One Touch Snap and an LTE version. 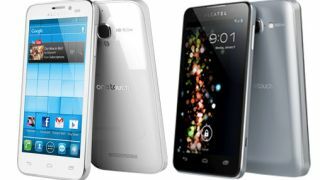 The Android 4.2 One Touch Snap has, according to the press release, "got game" and is carrying some decent looking specs, including a powerful quad-core 1.2GHz processor, an 8MP camera and a 4.6-inch display to show off both. And for those of you looking for something outside the norm, the phone comes not only in silver and white, but also "cloudy" which we assume means grey (but who knows?). The One Touch Snap LTE contains a 1.4GHz Snapdragon dual-core processor as well as all that 4G data-downing capability and, apparently, Android 4.1. It also comes in cloudy, as well as bluish black, metallic red and plain ol' white. Let's not forget that the company has also shown off the One Touch Fire sporting the Firefox OS, meaning it's been a busy few days for Alcatel at MWC.